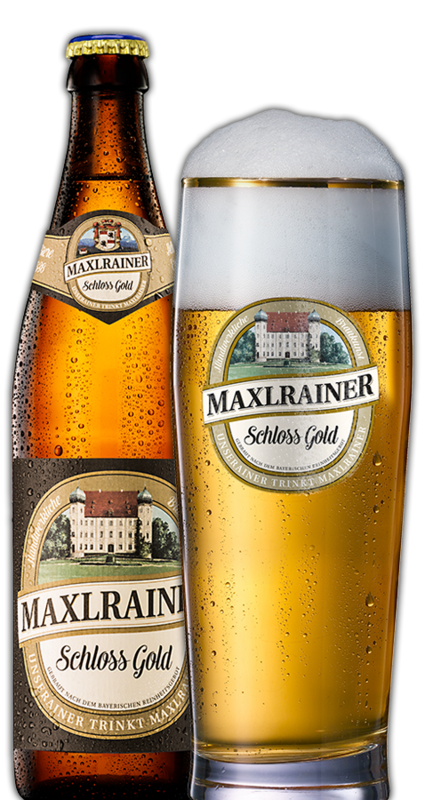 Schloss Gold Export ranks as the most popular of all beers in the Maxlrain range. This pale ale variety is instantly recognizable on account of its mild yet full-bodied freshness of taste, ingredients carefully selected in accordance with stringent Bavarian purity regulations and crystal-clear brewing water obtained from our own source in the Mangfall Valley. Cold storage for six weeks deep down in the cellars of MAXRAIN CASTLE BREWERY serves to enhance the harmonious taste of this beer which is also available from well-assorted beverage stores in neat and petite 0.33l bottles. The DLG Gold Medal has been awarded to SCHLOSS GOLD for whole years in succession.